In august 2016 two training about guanacos were executed as part of the environmental commitments of Interchile SA with RCA of “Plan de Expansión Chile 2×500 kV Cardones-Polpaico” project. Both training were implemented in collaboration with Fauna Nativa Consultores. The objective was to show and improve the techniques and methodologies that are used to deal with wildlife-vehicle collisions, especially with first actions and transportation of injured animals. We executed two training, one in Atacama district and other in Coquimbo district. Attendants were from Chilean Forestry Corporation (CONAF), Rehabilitation Centers, and the environmental agents from the company. 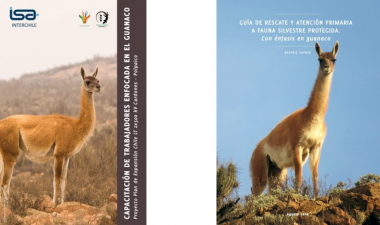 We also made a Guide about rescuing and primary care of endangered wildlife, with emphasis on guanaco. Main speaker was Beatriz Zapata. Second speaker was André Vielma. Coordinators were André Vielma and Daniel Valencia. The objective was to train the company workers for reducing human activities that can be harmful for guanaco, e.g. harassment, poaching, and interaction with domestic animals. We executed five sessions, with a total of 161 attendants. We also made prospectus and posters for the workers. Main speaker was André Vielma, with collaboration of Carla Orellana. Coordinators were André Vielma and Daniel Valencia.